Blowout Sale! 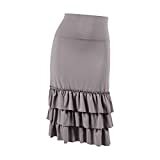 Up to 65% off on Skirts at Envy This Stuff. Top brands include Kosher Casual, HDE, HyBrid & Company, BohoHill, Chicwe, Billy's Thai Shop, Unique Vintage, Woman Within, Jessica London, Dancina, Peekaboo-Chic, Sakkas, YSJERA, Poetic Justice, SKAVIJ, Calvin Klein, & Lexi. Hurry! Limited time offers. Offers valid only while supplies last.